This is called Philippine Cockatoo in the Kennedy guide. It was once found all over the country. Their numbers have been decimated by illegal poaching of wild birds to sell as pets. Today they can be seen reliably in Palawan. There is a big resident flock of about two hundred birds that roost in Rasa Island Wildlife Sanctuary, managed by the Katala Foundation. In the morning cockatoos can be seen flying out from the island towards the neighboring islands where they feed on the seeds of the malunggay (Morinaga oleifera) tree. 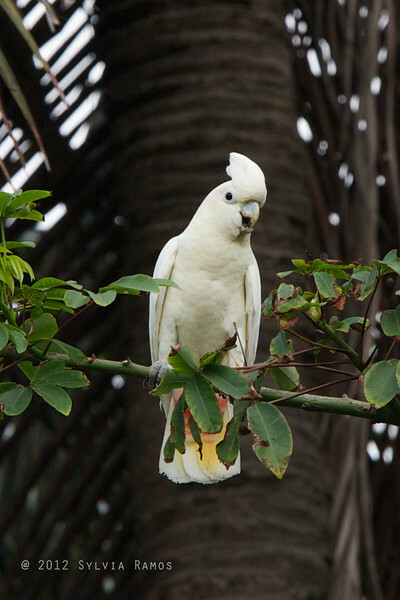 The Philippine Cockatoo or katala is a creamy white bird with a crest, reddish-orange undertail coverts, and and some yellow on the underparts. The males have dark brown eyes and the females have dark red eyes. It was heartening to see the pride that the residents of the neighboring island had in their role in preserving the Philippine Cockatoo. One lady even invited us inside her garden so she could show us the malunggay tree that the cockatoos favored. You could hear the pride in her voice when she pointed out that her tree was already so scraggly and leafless that they could hardly harvest from it!